Dark malts such as black malt and chocolate malt provide the flavor for most porters. This is part two of our series on porter. The series starts with an article on water treatment. The color and roast flavor in a porter comes from darkly roasted grains, most commonly black malt and chocolate malt, but other dark grains can be used as well. Knowing a little bit about these grains and how they are produced can help you decide how to use them in porters and other dark beers. Black malt, also called black patent malt by some maltsters, is arguably the most misunderstood malt in homebrewing. From many homebrew sources, you will hear that black patent results in a burnt flavor in your beer. If you understand how this malt is produced, you will see why this description is not correct. Black malt is made from barley that has been germinated and dried to 5% moisture. In others words, it’s been malted except for the final kilning. Barley kernels destined to become black malt are full-sized kernels. Because the kernels of the final product are smaller than that of pale malts, it is sometimes erroneously stated that black malt is made from smaller kernels of barley. The malt is then roasted in drums at 420–450 °F (220–230 °C). The temperature of the malt is monitored carefully because it can combust or turn to charcoal if it reaches 480 °F (250 °C). As roasting proceeds, about 15% of the weight of the kernels is lost as they give off acidic fumes. (These fumes are actually retained, which is part of the reason why dark grains are acidic.) At the end of kilning, which takes 2 to 2.5 hours, the malt is quickly cooled by being sprayed with water. This water instantly turns to steam, cooling the malt. In addition, some of the liquid is absorbed by the grains, swelling them slightly and resulting in a moisture content of 1.5 to 3%. The resulting black malt should be uniformly dark in color (500–650 °L) , but not contain charred or carbonized kernels. 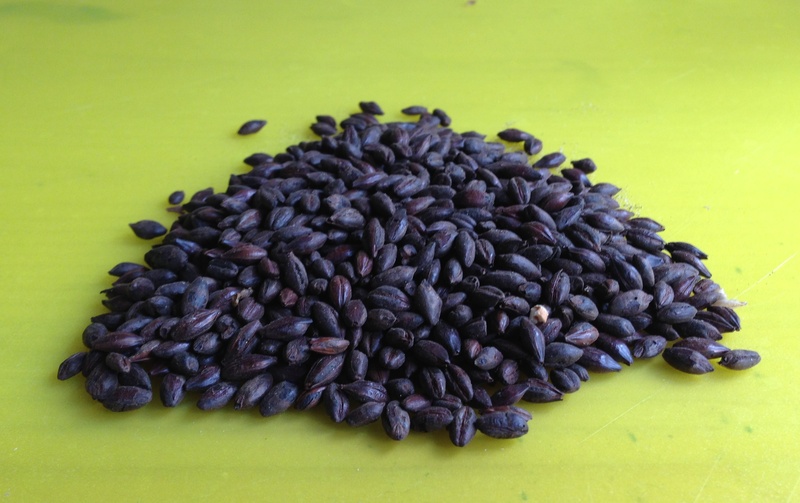 Although it is intensely roasted, and yields a sharp (sometimes described as acrid) flavor in large quantities, black malt should not be described as tasting burnt. That should be reserved for flavors resulting from actual combustion, and the products of intense roasting are not the same as the products of burning. An interesting thing about black malt is that it has very little aroma as the majority of its volatile compounds are lost during kilning. This is why many brewers use it for color adjustments to their beers — it can add small amounts of color without any dark roasted aroma or flavor. Black malt may also be made from dehusked barley. This is called debittered black malt because the roasted compounds that taste bitter in black malt are associated with the husks. Weyermann’s Carafa III Special (dehusked) is an example of this type of malt. Chocolate malt is made in a manner very similar to black malt. The initial malt is plump barley malt and is simply kilned to a lesser degree (350–500 °L), either through lower temperatures, shorter roasting times or both (within the range given above for black malt). Roasted barley is made in a similar manner to black malt and chocolate malt, with the exception that unmalted barley is kilned. The darkest versions (500–600 °L) of roasted barley are the heart of most stout styles. Roasted barley not only adds color and flavor to the beer, it will also darken the beer’s foam, something black malt or chocolate malt will not do. Dark grains, somewhere in the vicinity of 10% of the grist, give porter it’s dark color and roast flavor. 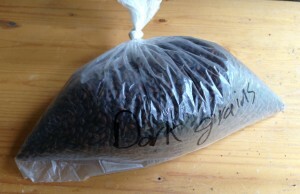 In most modern porters, black malt is the most abundant dark grain. This is especially true if the porter is meant to be a robust porter (as categorized by the BJCP). A porter may, however, contain a significant amount of chocolate malt — up to 100% of the dark grain portion of the recipe — if it fits more into the brown porter mold. Many commercial porters are made with a blend of these two dark malts. A minority of commercial porters also contain a small amount of roasted barley along with the dark malts. If you want to experiment, you can try substituting other dark malts for part or all of the dark grain component of your porter. Obviously, the more distinct the malt, and the more of it you use, the more your beer will drift away from the normal porter flavor profile. That doesn’t mean it couldn’t be great, though. In the next installment of this series, we’ll look at the other ingredients — malts, hops an yeast — that round out a porter. He also says if your porter has a strange bitter taste, you probably have too much chocolate malt. Personally I like the historic brown malt/black patent malt combination. Makes a great porter. Hmmm, Briess makes crystal malts at 90 °L and 120 °L as well as a 130 °L roasted special malt. More than one Belgian maltster makes Special B malt, which ranges from 150–200 °L. Weyermann makes a Special W malt at 105–120 °L. 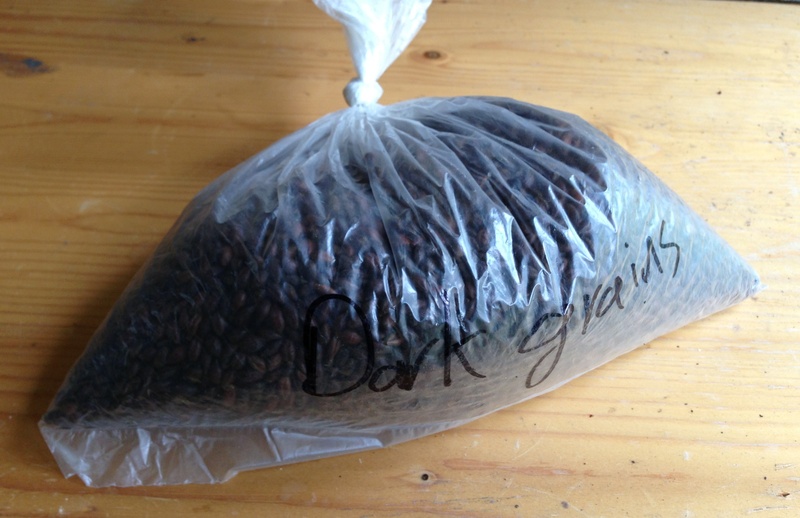 Franco-Blege makes a Kiln Coffee malt at 150–180 °L as well as a Caramel Munich 120 and . . . well, you get the idea. I don’t think the range of 80–200 °L is without malts. Also, with regards to the taste of chocolate malt. Chocolate malt covers a range of malt colors and roasting profiles (which overlap the roasting profile of cacao nibs and coffee). I think the chocolate malt I use is reminiscent of chocolate (although it doesn’t taste exactly the same) and from the comments of other brewers, I don’t think I’m alone on this. To me, roasted barley (~500 °L) gives a coffee-like flavor to beer (and roasted barley 300 °L gives a lightly-roasted coffee flavor), chocolate malts gives a chocolate-like flavor and black malt is its own thing, but has some dark chocolate notes. Each of these malts (and grains) has it’s own flavor. They don’t exactly mimic chocolate or coffee, but the above is my impression of those malts. Other people probably have different associations. I heard that interview too, and went to my beer pantry and chewed on some chocolate malts as well as roasted barley. I did find the chocolate malt I had on hand to be more “ash try like” than the roasted barley! Of course, we might be able to chalk this up to the power of suggestion. A dark grain experiment would be interesting, at least to me. I love porters and stouts.